The following are instructions for installing Bodhi Linux on to your computer from a working Linux system via a USB drive (eg: thumb-drive). This is the recommended method. Installation using another operating system or via CD/DVD is also possible. – A computer (imagine that! ) with an empty/blank hard drive/partition to use. – A USB drive that contains no important data – it will all be erased during this process! Note: visit the Selecting the Correct ISO wiki page for more information on which version of Bodhi is best for you (examples given are using the bodhi-4.5.0-64.iso). 3) Save the file to a location you will remember. 1) From the same link as above click the md5 link. 2) Save the file to the same location that you saved the Bodhi Linux .iso file. If you do not have Unetbootin installed already, please refer to the documentation for your distribution’s package manager, or visit Unetbootin’s home page and follow the instructions there. b) Insert your USB drive. f) ISO should already the default selection in the adjacent drop-down menu. If not, select ISO from the list. j) The Type: selection drop-down menu should default to USB Drive. If not, select USB Drive from the list. k) Select the drive location of your USB drive in the Drive: drop-down menu. Location will vary among systems. l) Click OK. After a few minutes your bootable USB drive will be created. **Tip – run the above command before and then after inserting your USB Drive – the drive that shows up will be your USB Drive (this can be help for new users to interpret the output from the ‘sudo parted -l’ command). This output is telling you that a 2 GB Toshiba USB drive plugged in has been allocated as /dev/sdb. From this information you will now be able to use ‘dd’ to create a live, bootable Bodhi USB drive. It will take a while to complete this command [without progress output (until it is finished)], so it may just be best to walk away and get a snack or some exercise while this step completes. Trust thy PC! Many systems will allow you to enter a “one time boot menu” by pressing F2 or F12 during initial system start-up. This will give you several options (CD/DVD, USB, Network, Hard Drive, etc) from which to boot. Look for a message during initial system start-up that tells you which button to press to enter the BIOS. Often this is the Delete key. From within the BIOS you are able to alter the Boot Sequence and choose USB as the first device. In some cases the BIOS requires that the USB stick is inserted into a USB port before it will recognize it in the boot order. A lot of newer systems are no longer coming with a BIOS. Intel’s UEFI standard changed a lot of mechanics in a computers boot sequence. Unfortunately, the details of the changes and exactly how to configure it is beyond the scope of this guide. Please feel free to stop by the forums or our IRC channel for help configuring your UEFI machine. 1) Insert the bootable USB stick. 2) Reboot to USB using the method determined above. Some users may have to select the xForcvesa or nomodeset option, depending on the video card. The only way to know for sure is to try and see. You are now in the Bodhi Linux Live Environment where you can explore and test Bodhi Linux to your heart’s content. **Note: depending on your system’s specs, this step may take a while to load – be patient! Note: you cannot directly install from your bootable USB drive, you must boot into the Live Environment first! 1) Initialize Installer: From the Bodhi Live Environment, locate and click the Install Bodhi Linux icon. 2) System Requirements: This screen is simply a reminder of minimum requirements. You may safely click Forward here. Connecting to the Internet is not necessary and ticking the box for Download updates while installing is not recommended. 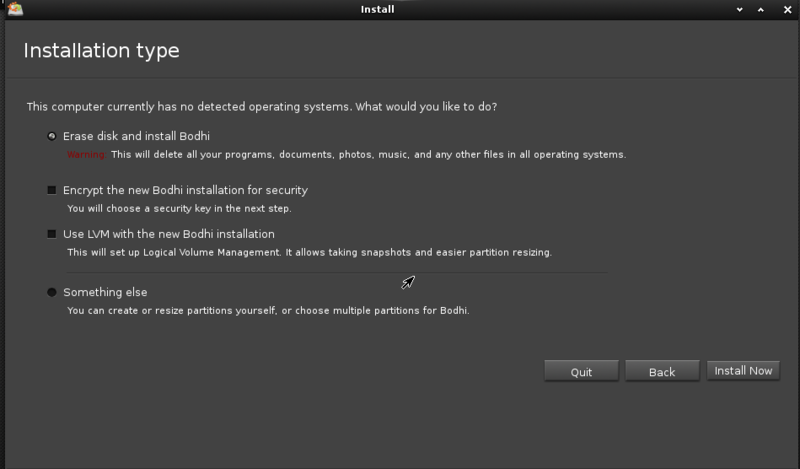 3) Installation Type: If you are installing Bodhi onto a system where it will be the only OS, select the Erase disk and install Bodhi option and click Install Now. 5) Time Zone: Select your time zone by either typing the name of a nearby city or clicking on your location on the map. 6) Keyboard Layout: Select your general keyboard style from the list on the left, then select the specific layout from the list on the right. There is also a text entry field where you can test your selections. When satisfied, click Forward. Note! The next screen is the last screen before installation completes. If you are unsure of any settings you selected you may use the Back button to double-check/change them. When satisfied, click Forward. 7) User Account: Enter a name you would like for the primary user (non-root) account. Enter the password you would like associated for this account twice (for confirmation). Enter a name you would like for your computer. There is also a radio button choice between Log in automatically and Require my password to log in – the choice is yours but we always recommend requiring a password. 8) Finalization: This last step requires no user intervention. A slide show of general Bodhi Linux info is presented. Sit back and relax – in just a few minutes you’ll have a shiny new Bodhi Linux system! 1) The first screen you will see is the GRUB boot screen. Bodhi Linux will be highlighted by default, and if no action is taken Bodhi Linux will boot automatically. If there are any other operating systems installed they can be selected by pressing the keyboard arrow keys then pressing Enter. 3) Once you are logged in, you will be presented with Bodhi’s Quick Start Guide and the default Theme. Some packages may have been updated to newer versions since the Bodhi Linux installation image was created. 1e) Once updates are installed, you will be returned to the eepDater screen and you can exit safely. The first time you launch Midori (the default Web browser), you will be taken to The Bodhi Linux Quickstart Guide which will help you get connected to the Internet among many other basic tasks. Visit the Bodhi Linux AppCenter for an extremely easy way to install your favorite applications. Ready to configure your new installation? Click here!